$60.00 1926 Group Photo of the Cadets of the Musical Platoon, 132nd Donetsk Regiment of the Red Army, large format. Sharp detail of clothing and caps. $1,400.00 "Combat Path of 139th Road Construction Battalion, February 1942 - October 1945". One of the finest albums we've ever offered, a unique photo history of a military unit that played major role in the defense of Leningrad. Includes hand drawn maps and original documents. $440.00 Pages from a late 1940's "Soviet Army in Hungary" deluxe Presentation Photograph Album. $40.00 Red Army medics transporting a wounded soldier by dog sled in 1943 on the Kalinin Front, a Tass (press) Photo, probably produced in a makeshift darkroom somewhere near the front lines. $150.00 Marshal of the Soviet Union Konstantin Rokossovsky standing with other general officers on a Budapest street before a parade, spring, 1945. $49.00 Two Male Officers with a Group of Servicewomen, an outdoor group photo, Very sharp and free of any defects. $35.00 General Morgunov addressing Military Cadets During the 1954 35th Anniversary ceremony of Kiev Higher Anti-Aircraft and Rocket Engineering School. $90.00 1930 Photograph of Six Red Army Engineer Officers Reviewing Plans at a Summer Encampment. $20.00 Studio Photo of Air Force Cadet with Map Case, 20 August 1938 Probable "sweetheart" photo; a sharp image and a good uniform study. 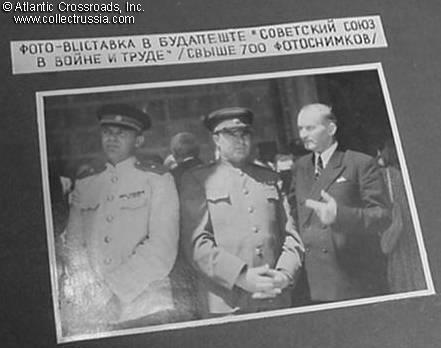 $220.00 Photo album on Brezhnev's visit on Cruiser Kirov, Kronstadt, 1965. $39.00 Eduard Shevardnadze, circa early 1980s	Official photo. Former Soviet foreign minister. $350.00 Rare original grouping of 14 photographs documenting Nikita Khrushchev's 1956 visit to Britain to attend the international naval procession at Spithead and conduct diplomatic meetings with the UK government. Since he was accompanied by Premier Bulganin, the British press hailed the Soviet visit as the "B and K Tour"! $95.00 Rare original circa-1957 Nikita Khrushchev labor award presentation press photo. With photographer's stamp.